This is the first in what will probably be an occasional series of screenshots and other stuff that I find as I go through the footage. Don told me during the camp that he had discovered some FOD (short for foreign object damage or stuff that can cause it – usually pocket change, the occasional mobile phone, etc.) in the cockpit during a flight with Paul on Day 3. I just happened upon the footage about 14:00 into the flight. 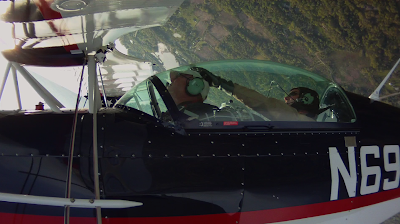 Don rolls inverted and sees the FOD just above Paul’s head. He taps Paul on the head to get him to move a little and then snatches it in this frame grab. Yep, I remember the moment well. If you roll the footage to about 16:27, you will get a great picture of my stomach departing the aircraft and landing on I-75! Wow, just ran across this blog on a tip from a co-worker. As a pilot and filmmaker myself this is exciting reading!